One lazy afternoon, Hubby made a request for some homemade curry puffs and that started the hunt for a recipe easy enough for me to follow. We preferred our curry puffs with a thin crust and so I used dough rolled out to about a 0.3cm thickness. Instead of the measly filling most commercially-available curry puffs offer, I determined that each bite of my curry puff be bursting with flavourful potatoes and pieces of chicken and thus, a generous dollop of filling went into each curry puff. Everyone agreed that the pastry was fantastic but the filling was not salty enough and that was when I realized I had forgotten to add the salt! Nevertheless, my dear supportive family and neighbours finished off all 23 curry puffs that night. 1. Boil cubed potatoes until cooked and soft. Remove from water and set aside. 2. Add flour, water and oil and knead together for 5-10 min. Let dough sit for 30 min. 3. Stir fry onions in some oil till soft. 4. Add chicken pieces and fry. Then add potatoes and fry. 5. Add curry powder and salt to above ingredients. Continue to fry till fragrant. 6. Add water until it almost covers the ingredients and fry till almost dry. 7. Roll dough to a thickness of about 0.5cm and place it over a curry puff mould. Put the fillings in the middle and clamp the mould shut to seal the edges. Remove excess dough from the edge of the mould. 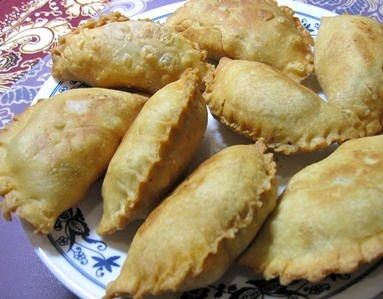 If you do not have a curry puff mould, you may cut the dough into circles and crimp the sides with your fingers. 8. Heat oil in wok and deep fry till golden brown.